This secluded and completely refurbished villa is tucked away in a private cul-de-sac behind an electronic gate on the south side of St. Thomas, and looks over the harbor and Charlotte Amalie from the upper verandah. An expansive fully fenced yard with flowering tropical gardens frames the pool and deck areas. The home is built on two levels - the carport, living room, dining room, a beautiful new kitchen with wine cooler and a den adjoining with cable TV, DVD player, Internet access, Wi-Fi, printer and fax, a powder room and the air-conditioned master bedroom/bath suite are all on the main entry level, and bordered by a sweeping verandah with stunning views and a stairway which leads to the pool and gardens. Three more air-conditioned bedroom/bathroom suites, all of which open out to a covered verandah on the lower pool level, are accessed via an interior staircase. Beautifully furnished and equipped, and very conveniently located near shopping, nightlife and beaches. The property sustained minimal hurricane damages but used the opportunity to completely refurbish the property including fresh new paint and completely new furnishings. New photography to reflect the property's upgrades will be forthcoming. I am originally from St. Thomas. I am a retired partner from one of the Big Four Accounting firms. My wife, who is originally from Germany, is a retired marketing executive. We have owned this villa for 18 years. We bought it when I had to travel frequently to the islands due to an involvement with the local university.. We rented the villa short term successfully during this period for 15 years through a local rental agency, but shifted to annual rentals when I stopped traveling frequently to the island. We recently decided to begin renting the property short term again to permit us some personal use, but this time we opted to market it ourselves through VRBO. The villa was built by a major U. S. bank for its top executive, and later bought and expanded by another major U. K. bank for the same use. It was designed and used extensively for entertaining. 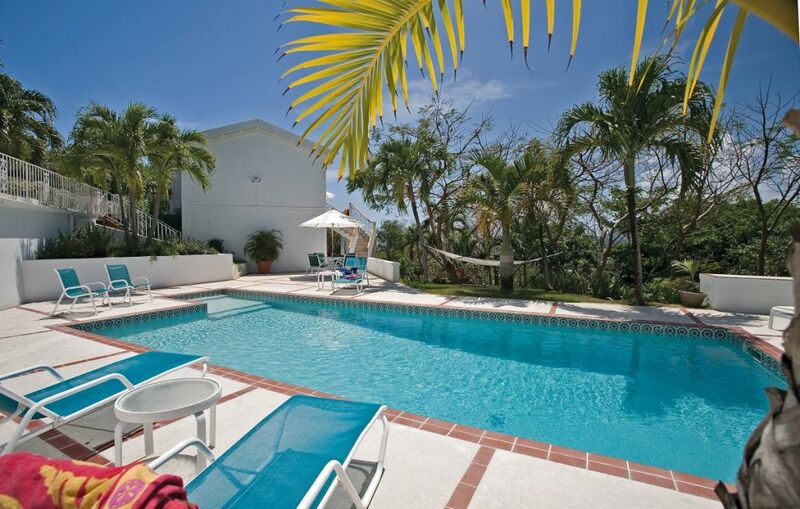 Our villa is located on a hill with views of downtown Charlotte Amalie, the inner and outer harbors, and the western end of the island. We were attracted to it because of the view and its location in the prestigious Bakkero neighborhood in Frenchman's Bay. The view from our balcony in the evening is simply spectacular. We are located just above the Frenchman Reef Marriott Hotel, so one has easy access to their facilities. We are also a five minute drive to downtown Charlotte Amalie where most of the major duty free shops are located. Previous guests loved the convenience of the location close to town, while at the same time perched on a secluded hillside location. We stayed at Captain's Walk for 9 days & enjoyed it very much. It was a very central location for us to be able to go sightseeing, shopping & to different restaurants. The view was beautiful overlooking the bay where all the cruise ships came & went. We felt very private & secure when staying at the house. The house was perfect for our large family of 9. It accomodated us nicely. The kitchen was well equipped with everything you could think of. I would highly recommend this house. If we were going back to St.Thomas, I would definitley stay there again. This home is the epitome of awesome! Great location and close to "downtown" and ideal for those quick trips to St. John via Red Hook. Very spacious home and grounds, with a large in-ground pool and tons of outdoor patio areas. If you're are looking for a secluded, yet convenient entertainment house - this is the home you need to stay at when visiting St. Thomas! The rental agent Leah was extremely helpful and knowledgable of "where the locals go" for great dining. But you won't need to go out to eat often with this home's gourmet kitchen!